The sound of the whistle welcomes the players to the basketball court; thus beginning the 2018 Boys’ Basketball tournament, hosted by MBIS. The students and teachers of MBIS are full of excitement and wait, eager for the matches to begin. 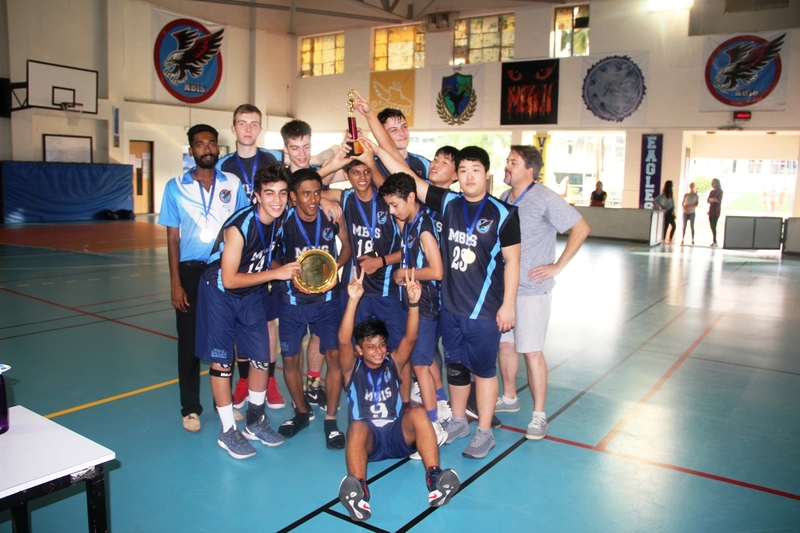 We at MBIS feel delighted to be the host of this tournament and the winner of the Boys Basketball matches for this session. To get the mood of the tournament we have interviewed the Coaches, Captains and Organizer of ISACI. We wanted to know how the ISACI platform helps students and schools collaboration, how the students are keeping balance of the academics and sports and how sports activity helps them to be fit mentally and physically. Q : What is your experience as an Organizer? A : I love doing major sporting events. It is a lot of work behind the scenes but that makes it even more rewarding if athletes do not see any problems. The players and coaches just want to be part of the experience and just want to play so it is extremely rewarding to see players happy and enjoying playing regardless of win or lose. Q : What are the challenges you face while you organize the whole event? A : This year was tough as I was off school for nearly 6 weeks due to family emergencies and then being in hospital. Thankfully the rest of the PE dept. was happy to help out. We had to do things like buy the trophies with Mr Amid in the shop sending me photographs and me in hospital trying to approve them all. 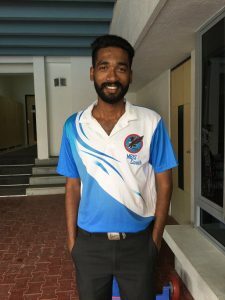 The school community is very supportive of ISACI so we don’t face some of the same issues as other schools: for example our families open their homes to visiting athletes and we are able to fill homestays very quickly. The biggest issue is time management and making sure I can juggle all my different school commitments. Q : Are you happy with our students performance this year? Any special comment as a winner of the tournament? A : I am always extremely happy with our students performance regardless of the position we finish. The commitment and sportsmanship they show is to be applauded. Saying that, this year is special as we won 2 years in a row. For the smallest school in ISACI we are the biggest force to be reckoned with. I am always proud of our students and players. Q : What is the best rewarding part of being the Organizer.? A : Definitely watching students achieve things they did not think possible. For example this tournament as a team, MBIS was able to change up it’s strategies and in 2 matches work on trying to have every player in the team score points. This is unusual but by the end of the last match all 10 players had scored points. The cheer when the final player scored was as loud as when we won matches. This showed also the huge improvement over the years in school and team spirit. Q.: Tell me about the ISACI event we are at today? 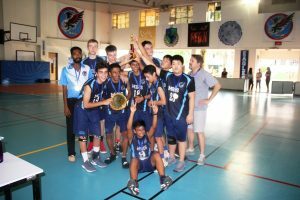 A : It is a sport event that requires great physical endurance and 3 teams from different International schools across India from Bangalore, Delhi, MBIS, and Hyderabad come to our school to play basketball. The students get exposed to playing basketball with different teams who they are not used to playing with. The competition is at a higher level and they improve their skills and gain experience because of this. It will help them in their college basketball career. It is a very good tournament and I have been participating in this for 2 years. Q.: How well do you think your team is prepared for this tournament? A : Quite Well, We won against the Hyderabad team and so we feel confident we will win the entire tournament. Q : How do you think you motivate your team members? A : I motivate my students by pushing them to do their best and by asking them the reasons behind what they are doing. I motivate them by reminding the consequences of not performing to their best ability during the game. The consequences is letting down the team. I am not too strict during practices but I do my best to coach them. A : We practice basketball moves and practice different throws like a three point shot and other positioned shots. We do basketball drills that help us improve our performance. These kids have been doing them for a long time so they are now accustomed to them. Q : What are the challenges you face while coaching your team? A : There are not many challenges in coaching this team. The players are very capable and practise a lot. Sometimes it is hard to make everyone at the same level of skill in the team. Q : What kind of training do you do? A : As I said we focus on fitness because it is very important in today’s game, and we work on fitness mostly and we work on different skills and we play as a team. Q : What challenges do you face while coaching the team ? A : We have not many sessions to practice, so that becomes one of the challenges we always face. We have a very limited time to practice. Secondly, we have multi ability students, so we have to make sure that whoever is on the team, we have to work on everyone’s strength. This is what will help them work as a team and not learn while on different levels. Yes, we mostly work on their strength and that is a challenge because it is difficult to teach a student individually when there is a whole team left. Q : What is the most difficult part of being a coach? A : I think to keep motivating our students. Once they are ready to play, once they are clear about the goal and if they are able to perform then that is all fine for the team and player. Q : How do you think your team has played today? Q : How do you balance your training and school work? A : We have 2 sessions for the school team practice. That is how we have come here, we have all other classes happening and we have after school activities which does not hamper the regular subject classes and that is how we balance it. Q : What is the best and most rewarding part of being a coach? A : The most rewarding part of a Coach is to be with students and their learning process and how everyone works together as a team. Secondly, we come to a different place where we meet other people and that is a good part of being a coach. We have come here and seen many more schools coming together but, when your team wins it makes you definitely happy. Q : Do you think you will win the trophy today? A : No, we are not in the run of the trophy right now but we will be looking forward for the 3rd place right now. Next year we will practice more and try and win that trophy. 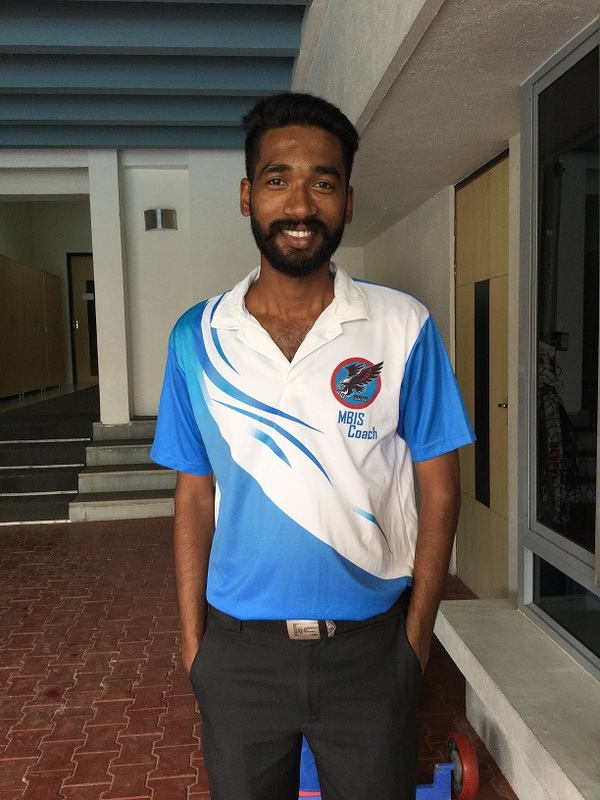 ISACI Students – Nitin Srinivasan, Vice -Captain, International School of Hyderabad. Q : Tell me about the ISACI event we are at today? Today we are at the ISACI season one boys basketball, with schools competing from Hyderabad, Pune, Delhi and Bangalore. Q : How much time per week is required for practice or you give for your practice? A : 1 and half an hour sessions per week on Tuesday, Friday and Saturday. Q : How do you balance your academics and sports? Is it challenging? A : No, It is not challenging because I find that basketball helps me with academics and energizes me. Q : What challenges do you face to be in the team? A : You just always have to give it your 100% and that is just the main part of it. Q : What kind of training do you get? Q : What do you think about your team? Is it prepared? A : Yes, our team is prepared as we have been practising for the last couple of months and I think we have a good shot at the championship this year. Q : What is your motivation to be in sports? Q : Who is your mentor? A : Our coach, we have 2 coaches Mr Prasad and Mr Paul and they have helped us with our game. Q : How long are you in this team ? Q : What aspect of this game comes easiest to you? What is the difficult one? Q : What has basketball taught you in your life? A: To always do your best and never give up. Q : Do you have any fondest memory you would like to share with us? Book Week 2018 Linking our approaches to teaching and learning in the Maths department to the MBIS mission.